Serving as a representation of nobility, royalty, and legacy for thousands of years, the symbol of the crown is not a new one in tattooing and has adorned the sleeves, chest, and back pieces of everyone from pirate leaders to gangster warlords, ’60s rock stars to hip-hop legends. Today, more than ever before, tattooing has become a status symbol and can be used to denote the philosophical tenets of the bearer. The crown as a tattoo and icon has found a perfect fit among this new age of inking, especially for male tattoo enthusiasts, with grandiose and smaller pieces alike bringing different meanings to different men. 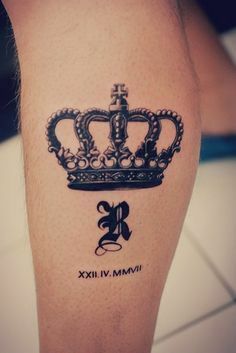 Crown tattoos for men, like all tattoos, have different meanings for different people, and can be designed in a plethora of different, creative ways to better represent and showcase those individual meanings. For many men, a crown tattoo is a symbol of personal power and serves as a reminder of their responsibilities of being in a leadership role in their life. 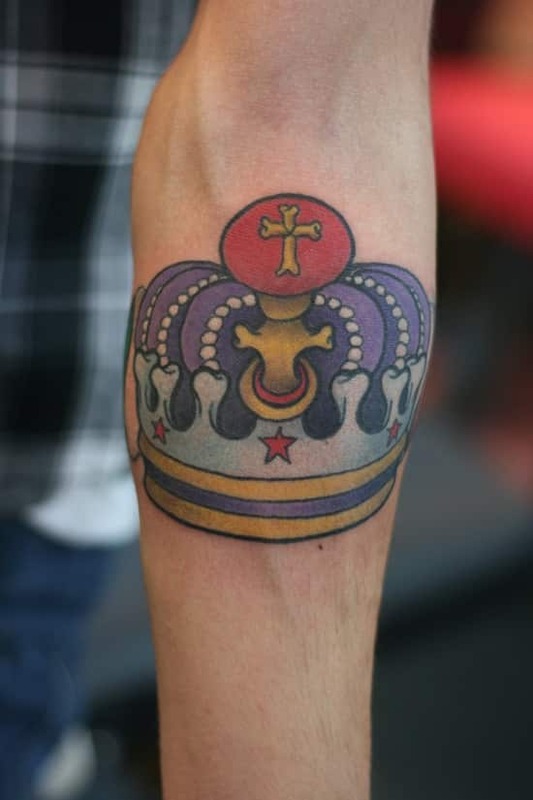 Specially designed crown tattoos can possess a masculine energy that beckons back to the kings and rulers of the past, linking the wearer with a history of royalty and nobility through leadership. For others though, crown tattoos have a deeper and more intrinsic symbolism. 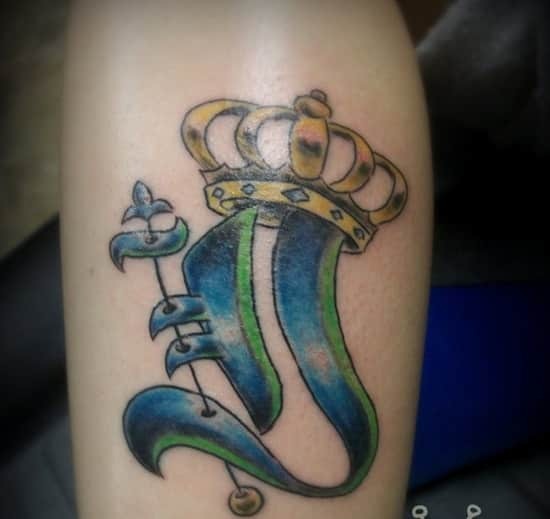 Crown tattoos for men can be an excellent motivation and emblem for men who have taken their own paths in life and are striving or have succeeded in supporting themselves and their family with their passions. 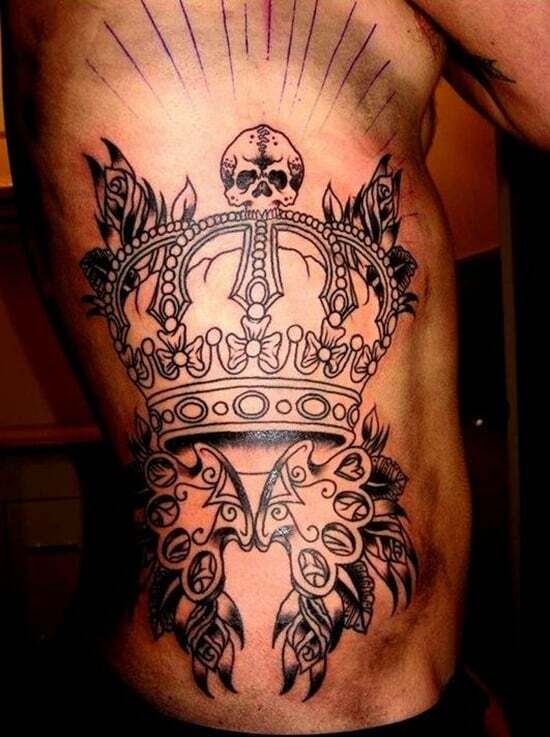 Crown tattoos have become a representation of making oneself into a modern king and a master of your own domain. Are Crown Tattoos Great for Men? As many different meanings as crown tattoos can have for different men, there are just as many designs and variations in ink of the icon. Elaborate portrait pieces and simpler, smaller motifs alike have been given their own original interpretations by different artists to better exhibit the individual meanings of the tattoo. 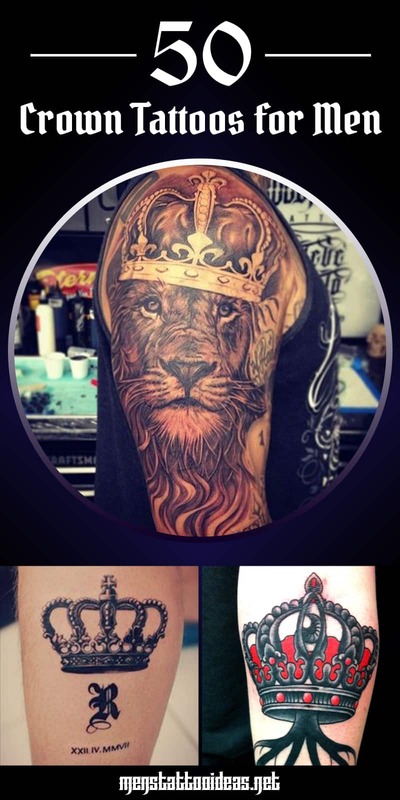 Lions and other noble predators, Medieval weaponry, and religious iconography are common images associated with larger crown tattoos such as those designed for back or chest pieces, while many people have incorporated the image and those related to it into entire sleeves centered around regal and royal symbolism. The image has recently seen popularity as a shared tattoo for many celebrity and artist power couples representing an apportioned dominion of their lives and their individual careers. Many different versions of the crown tattoo have been designed to show the likeness of a king and his queen. Crown tattoos for men come in as many different shapes, sizes, and ideologies as the men that wear them. Whether you’re searching for something to highlight the leadership role you serve in your life or to show your commitment to your queen, there is a variation on the design for everyone. Regardless of what meaning the symbol has for you, by finding the right artist with the right creative vision for your ink, you can ensure that you walk out of your local shop with a piece that keeps you motivated, moving, and claiming your kingdom as your own for the rest of your days. Small jewels and tiny beads line each elegant curve of this royal crown, from the tip of the cross down to the circular base. Heavy bold lettering is seen under the crown, while smaller roman numerals make the tattoo unique and significant. 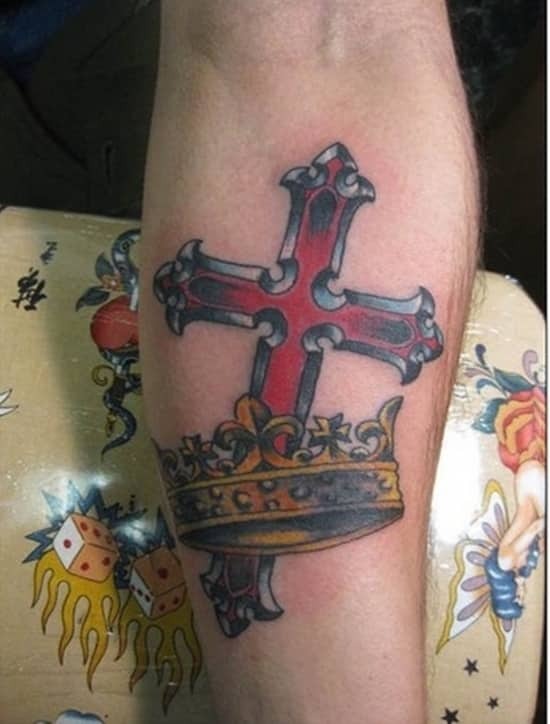 A cross and crown combination makes for the perfect tattoo. The huge cross has a thick and lustrous border, and filled with vivid red shade. It nestles a golden crown towards the bottom, appearing with carvings and details embedded across its circular form. 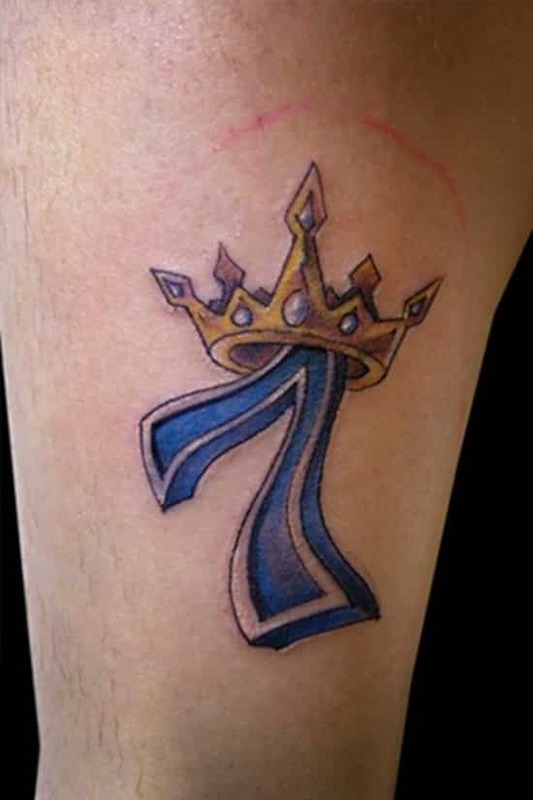 The number seven is given life with a wavy outline and shaded in a cool blue tone. A pointed crown rests on top, with shiny jewels resting on each of its similarly shaped diamond tip. Oval gems line the base of the golden crown. Black and white, thin lines, darker textured shades altogether deliver a simple yet beautifully drawn crown tattoo. A small skull head rather than a cross sits at the top center, while roses with pointed petals and a glowing effect enhances the entire image. 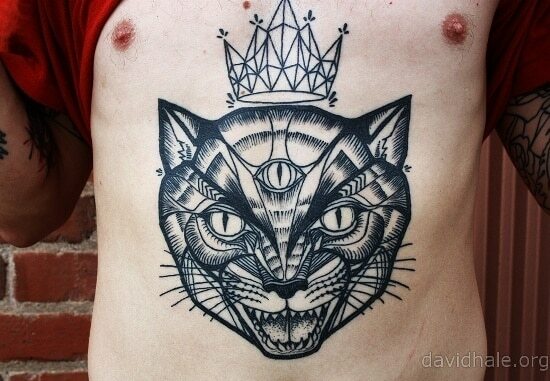 A huge cat with a patterned, geometric crown floating above its head appears alluringly fierce with the sharpness of its tiny fangs, the great markings on its face that were inked to the last detail, and the three mysterious eyes look straight past you. Grey and red tones create a solid and strong, striking and stylish image of crown tattoos for guys. 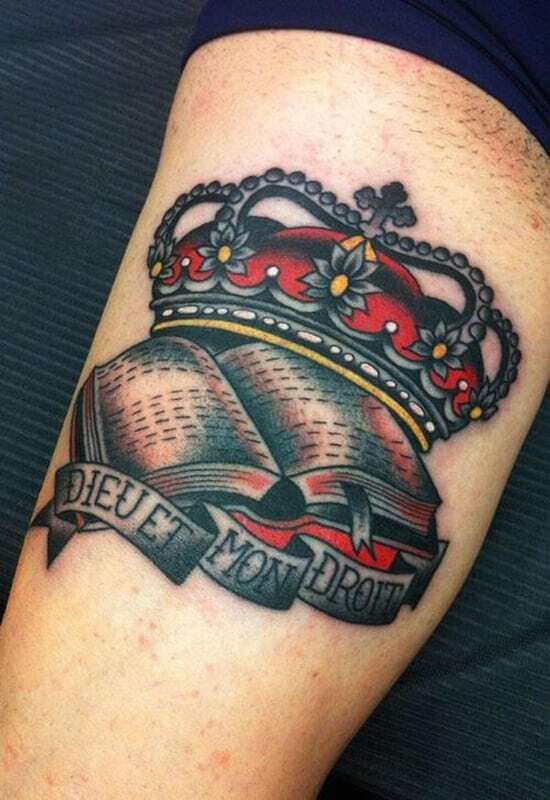 A royal crown rests on top of an open book with a ribbon banner spread at the bottom, containing meaningful words in bold letters. 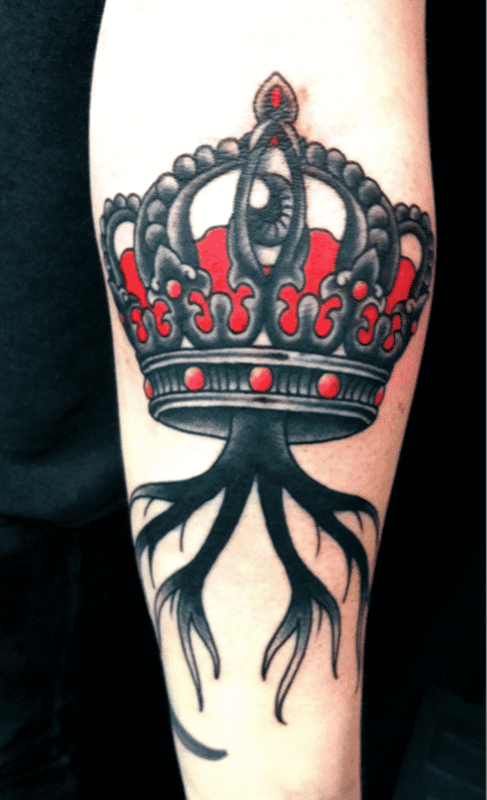 This crown tattoos idea elicits a fiery form with the brilliance of dark black and vibrance of the red color. Centered on the crown is an upright eye with pupils clearly visible, and eerie flowing roots extend from the jewel-studded base. A fancy letter J is skillfully inked with curves and great attention to design and detail. Blue and green hues fill the exquisite lettering that seems to display a character of its own as it holds a scepter and a golden crown shines through on its head. 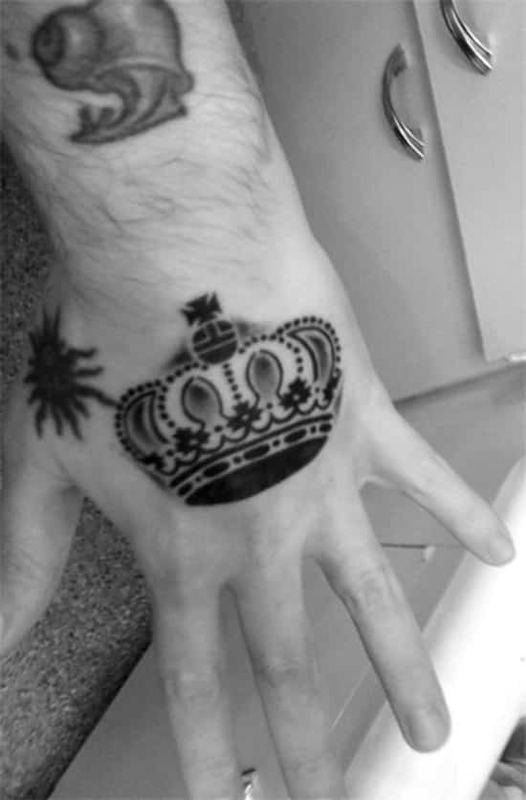 This crown tattoo design fits the top of the hand perfectly with the royal object’s rounded form. Tiny dots connect the cross to silhouettes of jewels and gems down to its base as the shadows give depth and a classy black and white effect. The most colorful tattoo ideas for men arrives in the elegance of purple, the richness in gold, and the velvety luxury of red infused in a single crown. The traditional look is given a very attractive modern twist with the addition of varied shades.